A 3¼ mile circular walk from Charing Cross Station. Note: you may find it useful to pick up a copy of the free magazine 'In & Around Covent Garden' from St Martin-in-the-fields Church. This has details of businesses and events in the area plus a map in the centre pages. There is a drinking fountain on the corner and a sculpture of Oscar Wilde by Maggi Hambling. Ahead are the former National School, Vestry Hall and vicarage buildings of 1827-30. The church was rebuilt by James Gibbs in 1721-6. In St Martin's Place is a memorial statue to Nurse Edith Cavell by Sir George Frampton. English National Opera occupies the splendid Coliseum designed by Frank Matcham in 1902-4. 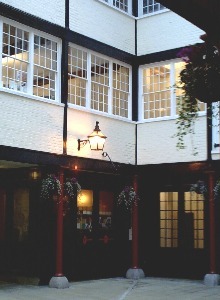 Alongside is narrow Brydges Place and opposite is the Duke of York's Theatre where 'Peter Pan' was first staged. Further along is the Noel Coward (formerly Albery) Theatre and the ornate Salisbury pub of 1898 with original fittings. This has a number of listed buildings. A plaque marks the location of Chippendale's furniture workshops at number 60. The Garrick Club of 1864 is on the right. Follow Rose Street to the left of the pub and continue across Floral Street. The Ching Court development by Terry Farrell is situated on the right. There are plaques with more information. Go along Tower Court between the theatres. Cross Tower Street and bear left into Earlham Street. This is the site of a street market. Seven Dials was laid out by Thomas Neale in 1694-1714 as a respectable residential suburb. Seven streets radiated from a central polygonal space featuring a Doric column with 6 dials. As the area became less fashionable houses were converted into shops, lodgings and factories, many with immigrant workers. The column was removed in 1773 and re-erected at Weybridge, Surrey in 1882. The replica replacement was put up in 1989. From Seven Dials go north along Monmouth Street. The former French Hospital building is on the left. Go through Neal's Yard (adjacent to number 31) bearing right to exit. Cross Shorts Garden and go through the Neals shopping complex into Earlham Street. The Donmar Warehouse Theatre is sited here. Go left then first left along Neal Street. At the end go right into Shaftesbury Avenue and right into Endell Street. On the right is the former St Giles' National Schools building designed by E M Barry in 1860 for 1500 children. The London Swiss Protestant Church of 1854 is by George Vulliamy. Further along are the former glassworks of Lavers and Barraud (1859) and the Cross Keys pub. Brownlow House is 18th century. This has had a number of notable residents. The left hand side is dominated by the Freemasons' Hall and opposite are some associated shops and a former school building. The hall is the third on the site and was built in 1927-33 as a memorial to Freemasons killed in WWI. Go left into Wild Street. This passes the former tobacco factory of Lambert & Butler (now flats) and a Peabody Estate of 1880. On the right is St Clement Danes School of 1907 and on the corner of Kemble Street is a distinctive restaurant with neo-Ottoman interior. A little further along on the left a disused churchyard has been made into gardens with a lodge to the left and a former mortuary to the right. Return to the junction and go along Russell Street. On the left is the Theatre Royal, rebuilt for the fourth time in 1810-2. The columns and lamps date from 1831. The Fortune Theatre of 1922-4 has a small foyer and only 440 seats. It adjoins the Crown Court Church of Scotland built in 1909. There is a statue Young Dancer by Enzo Plazzotta and several K2 telphone boxes. A plaque records famous residents of Bow Street. The Magistrate's Court and police station were built in 1879-80. These replaced an earlier building on the west side. It was from here that the Bow Street Runners founded by magistrate Sir John Fielding operated. Note: Between 10am and 3:30pm Monday - Saturday the Royal Opera House is open to visitors. Outside these times you will have to go around the building into the Piazza to continue the walk. The present (third) building was designed by E M Barry in 1857-8. There are some display cases in this area. It is sometimes possible to go up to the Crush Room via the Grand Staircase. Access the Vilar Floral Hall (built 1858-60) from the new stairs if this is not available. The building was extended and remodelled in 1997-9 at a cost of £213m. Take the escalator up to the Amphitheatre Bar. To the right are exhibition areas. Straight ahead through the glass doors gives access to the terrace with views of the costume making department and over Covent Garden. The market buildings contructed in 1830 to the designs of Charles Fowler were in use until 1974. Return down the escalator and stairs and exit via the box office and shop into the Piazza. From here exit on the east side into Russell Street. A plaque on number 8 records the first meeting of Dr Johnson and Boswell. The London Transport Museum occupies former Flower Market premises of 1872. Tuttons was formerly Turkish Baths. Penhaligon perfumers has an attractive shop at numer 41. This passes the rear of the Jubilee Building of 1904. There is a plaque to the actor manager David Garrick at number 27. On the left is Corpus Christi RC Church of 1873 and on the right Rules Restaurant. There are plaques to Voltaire, William Terriss and J W M Turner. The Lady Magazine occupies a former tea warehouse. This leads to St Paul's Church designed by Inigo Jones in 1631-5 for the 4th Earl of Bedford. It is known as the actor's church because of its theatrical connections and there are several memorials within the church. There is no entrance from the Tuscan portico in the Piazza as this is the east (altar) end. This street has some fine Georgian houses including number 43 by Thomas Archer. From the Piazza go left into James Street and left along Floral Street. Go right into Banbury Court then left through the Carriage Hall (1833). This attractive complex is pictured in header. The Mercers Company own a number of properties on the north side. The street was a centre for carriage building and cabinet making. GAP occupies former carriage works. Further along Covent Garden Station designed by Leslie Green in 1906 has ox-blood tiles. Go right at James Street back to the market area which is worth exploring. Exit at the south east corner and go along Southampton Street. At the end go right along the Strand back to the station.